Melanie Watkins always dreamt of becoming a doctor. When she found herself sixteen and pregnant, that dream seemed out of reach. Having been raised by a single mother, Melanie knew the challenges single motherhood presented. Despite the uphill climb, Melanie made the decision to raise her child on her own. This is an inspiring story of faith and perseverance as a teenage mother beats insurmountable odds to create a brighter future for herself, her son, and her community. 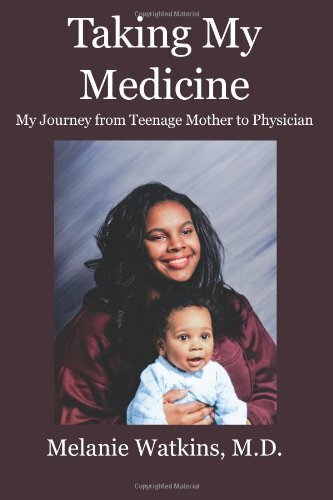 Taking My Medicine is a story of triumph — overcoming the stigma of a teenage pregnancy and the journey to Stanford medical school. Read and enjoy this story about a young woman fighting the odds to raise her son, find the resources to educate herself and follow her passions. Drawing from pieces previously published in Chicken Soup for the African American Soul, Chicken Soup for the Single’s Soul, Woman’s World Magazine, What I Learned in Medical School: Personal Stories of Young Doctors and This Side of Doctoring: Reflections from Women in Medicine, Melanie Watkins wrote the memoir for single parents, students of color and disadvantaged youths to encourage them to dream and to give them hope beyond their most difficult circumstances.